Sidmouth Folk Week 2008 - a year to test the organisers. 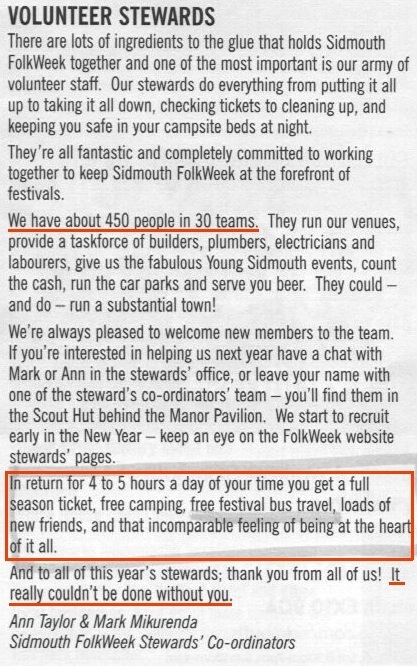 Sidmouth Folk Week 2008 - a year to test the organisers - and a few comparisons to Towersey in 2008. Comments and observations on Sidmouth 2008 are spread over several pages, as shown below. Either use this sub-index or simply click 'next page' at the bottom of each page. 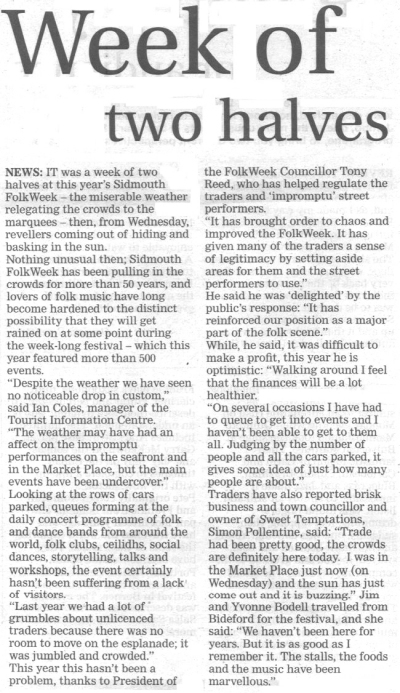 Sidmouth Folk Week 2008 - should the Bulverton be axed? - and why youngsters prefer Towersey. Sidmouth Folk Week 2008 - Health and Safety - the rule of the box-tickers. Sidmouth Folk Week 2008 - Health and Safety - how officialdom put folkies at risk of injury? Sidmouth Folk Week 2008 - Social dance - in three church halls only - and were these really workshops? 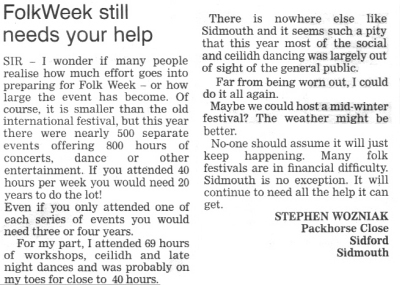 Whilst the main (or most obvious) problem in 2008 may have been the weather, Sidmouth Folk Week continues to exhibit organisational and structural problems. However, what is perhaps most remarkable is that despite a series of challenging logistical and financial problems Folk Week has now survived for four years - 2005/6/7/8. The organisers have struggled to find a format that would work sustainably and may be close to realising it. Many people and local organisations have helped, including Folk South West, the Sidmouth Steppers and Great Western Morris. Nevertheless, the main credit must go to a mere handful of stalwarts who have simply refused to let the event die. Whilst it is still some way from satisfying 'all of the people all of the time' its internet presence, marketing literature and artistic achievement were quickly developed to rival those of any other festival in the UK. The last two years, 2006 and 2007, were difficult financially with net losses apparently being made. 2008 was well attended with many venues full but once again, the finances may show a loss. This is despite that cost saving measures such as smaller marquees and less fencing around the campsite were both obvious and, in some cases, most unwelcome. The weather may have helped to some extent by keeping people off the beaches for all but a couple of days. If the event did not make a healthy profit under these circumstances, the key question is how much longer can the organisers 'scrape by' making losses or small profits. Continuing year on year losses are unsustainable. With a recession looming, 2009 could be very challenging for the new Festival Director, Leo Beirne. This August was the most dismally overcast on record and will end in a washout, forecasters have said. Thunder storms on Sunday will bring to a close the wettest August the UK has seen for four years and the least sunny since sunshine records began in 1912. Forecaster Michael Dukes said: "There has been a real lack of sunshine this year. It has been the dullest since the early part of the 20th century. "We have only seen around 90 hours of sunshine, the average for this time of year is 200." He added that although August has generally seen wet and dull weather, temperatures had been "bang on average" as cloudy evenings have stopped temperatures dropping too far. Autumnal weather is not expected to fare much better, he said, as more showers are predicted for the first week of September and temperatures will drop. 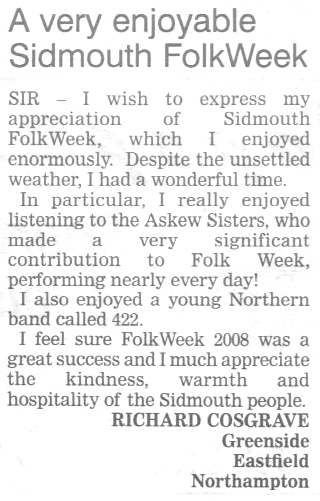 Letter in the Sidmouth Herald, 29 August 2008, highlighting that no-one should be complacent about the future of Folk Week. The Ham Concert Marquee - difficult to see how it could get even better? This venue for Sidmouth Folk Week seems unable to attract substantial criticism. The tiered seating (an idea of the new festival director Leo Beirne) was adjudged a great success - whether it was cost effective is a moot point. The superlatives heaped on some of the 2008 concerts ranged from sublime, outstanding, a perfect evening, simply fantastic - any many more. Both the artists and the sound quality were praised. The prices attracted a few raised eyebrows - especially the Thursday evening Eliza Carthy pre-festival special at £20, and not included in the Ham season ticket. This was attended by only a few hundred people and tickets were being sold for £5 at the half time break to try and get more people inside - and maybe to limit the net losses. Eliza Carthy probably doesn't come cheap! Ticket structure - approaching a stable state? The last few years have seen many changes in ticket structure as the organisers have struggled to meet conflicting demands and increasing costs. It now seems almost to have stabilised but there are some inconsistencies - and demands for some different types of tickets. In particular, the weekend (three day) season ticket (which is really a 2.5 day ticket) could be extended to be an 'any three consecutive days' season ticket for people who simply cannot afford the time or money for an entire week. Many festivals only run over three days and this would give people time to experience Sidmouth maybe for the first time - it may be too far away just to come down for the day and too expensive to come for the whole week. It would be easy to do administratively as day seasons already exist. A 'dance season ticket' was suggested by quite a few social dancers and workshop attendees, this being a fairer alternative to using up a workshop ticket and then finding the workshop was really not what you hoped for. It would provide a 'dip in and out' facility of a season ticket but be dedicated to dance/workshop/ceilidh events for people who didn't want to splash out on a full season ticket - Sidmouth needs to attract many more dancers if this side of the festival is not again to be marginalised, as it was 13 years ago when Ray Goodswen took over the dance programme. Also, the number of 'house full' dance events and Blackmore ceilidhs being either 'house full' and/or unbearable means that people should have the option to go elsewhere. People seemed to accept the Ham Season in addition to the Full Season - there were grumbles of course, but with the festival still not 'soundly in the black' the management cannot afford to sell the Ham seating for less than they do now - it is probably what keeps the whole event (almost) solvent! The full season tickets (excluding Ham evening concerts) are already at the edge of affordability for many people, especially when the expensive camping is included. There are other more minor suggestions - these have been passed to the management following my experiences in the box office during 2008! In general, the festival is now pleasing most of the people most of the time, and the existing ticket structure needs to become stabilised, albeit perhaps with some amendments and additions. There were some moans in 2008 - as always! In particular the promised 'free' bus pass for stewards did not materialise owing apparently to the festival not getting the deal it hoped for from the bus company. Some past stewards did not volunteer in 2008 because their ticket did not include the Ham evening concerts (although they were eligible for tickets for £4 rather than typically £18). Bus passes would have cost the festival £8 x (say) 400. The fact that management chose not to honour promises in the working programme may serve as confirmation of the dire financial position of the whole event. Upsetting quite a few stewards (upon whom the festival relies for its operation) for the sake of maybe £3200 is not a decision that could have been taken lightly. As usual, there were pleas for more stewards throughout the week. A 'part time' steward commitment might be one idea. Few people want to work 20 or more hours during a week when there is so much to do and see.